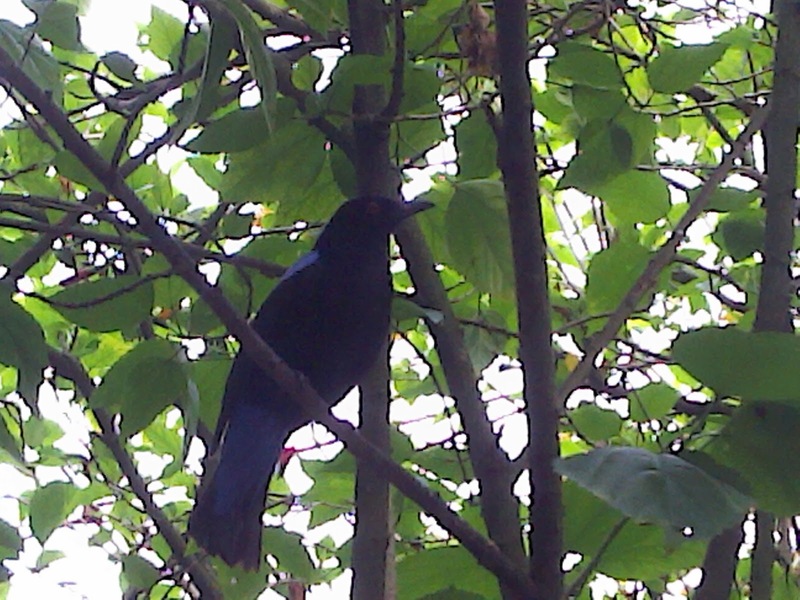 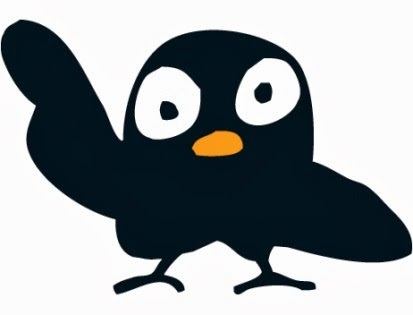 Asian Fairy Bluebird. Beautiful male species with a harem of females in this Bulbuls section of the Bird Park. Superb Starling from African region according to Wikipedia at http://en.wikipedia.org/wiki/Superb_Starling. More pics of the Starling enjoying local papaya below. 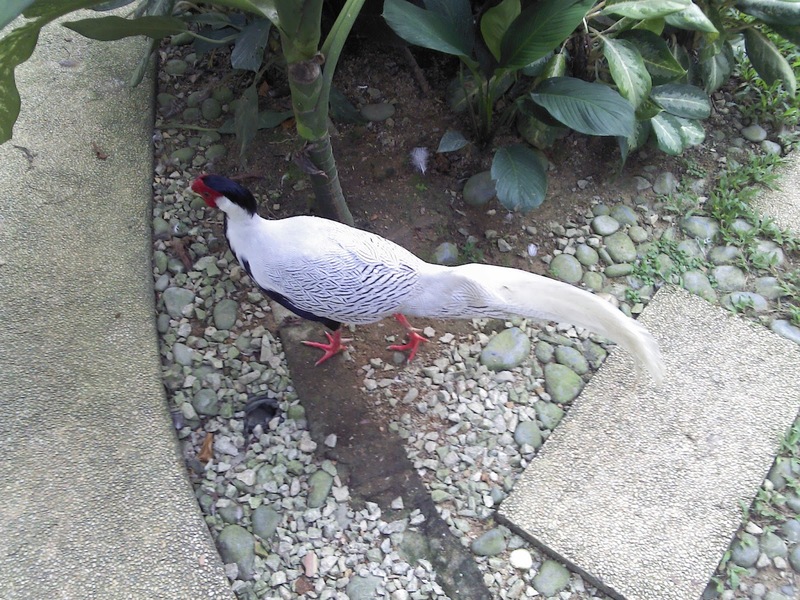 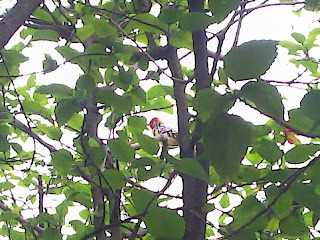 Silver Pheasant. Female species roosting at the base of the potted plant below. 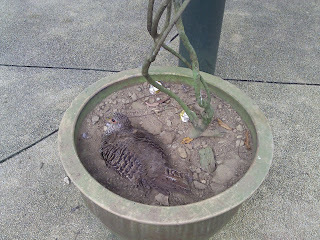 It appears to be getting ready to lay eggs! Silver pheasant. 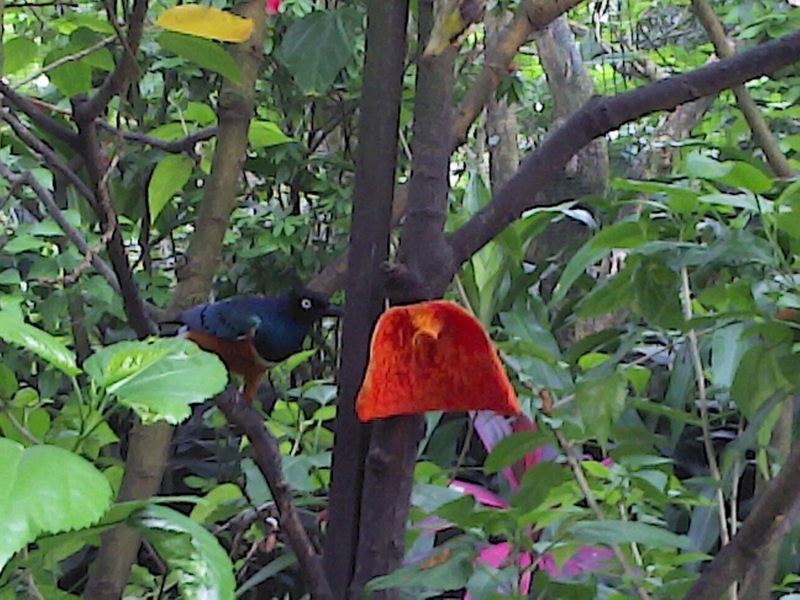 Male species enjoying his walks around the aviary. 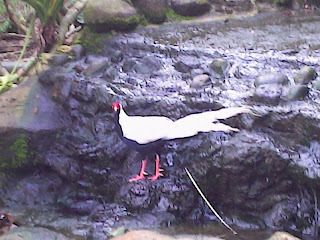 Silver pheasant surveying his territory from the mini waterfall vantage point. 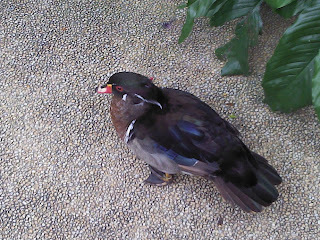 Mandarin Duck. 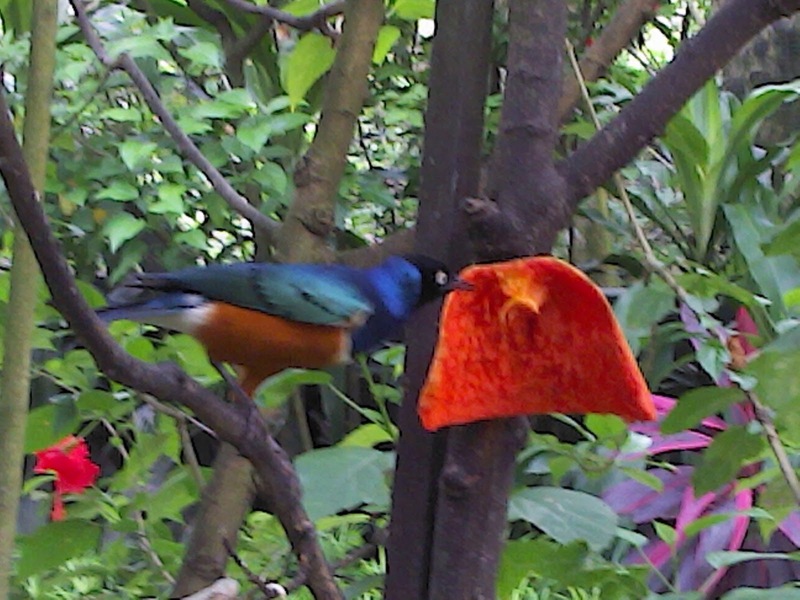 Male species looking resplendent below. Asian Fairy Bluebird. 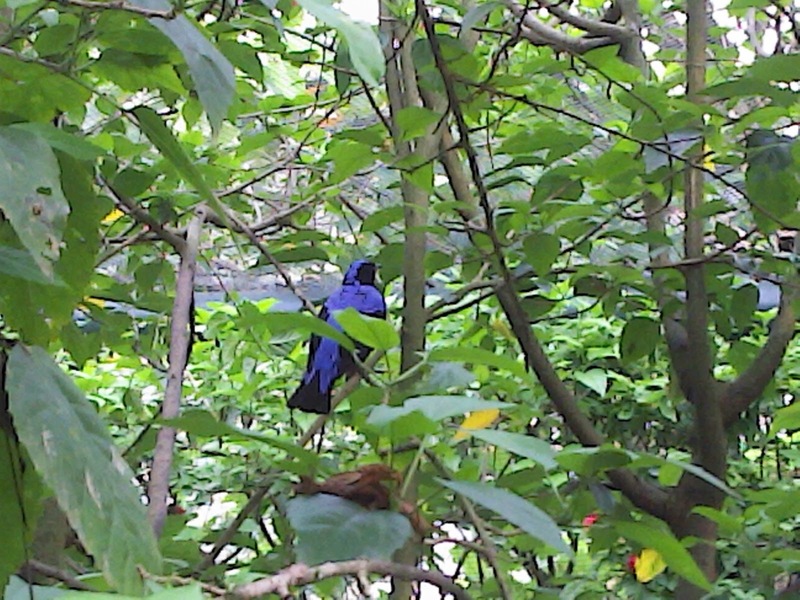 Male species striking blue colours from the back. 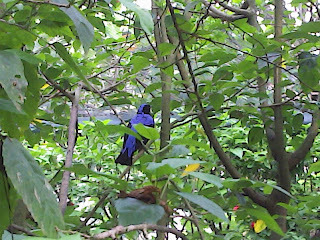 Asian Fairy Bluebird. 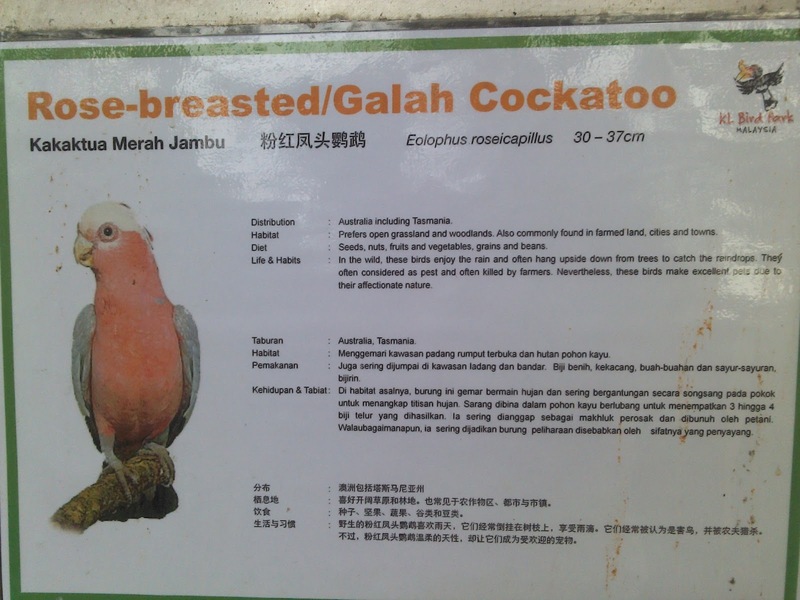 Female species. 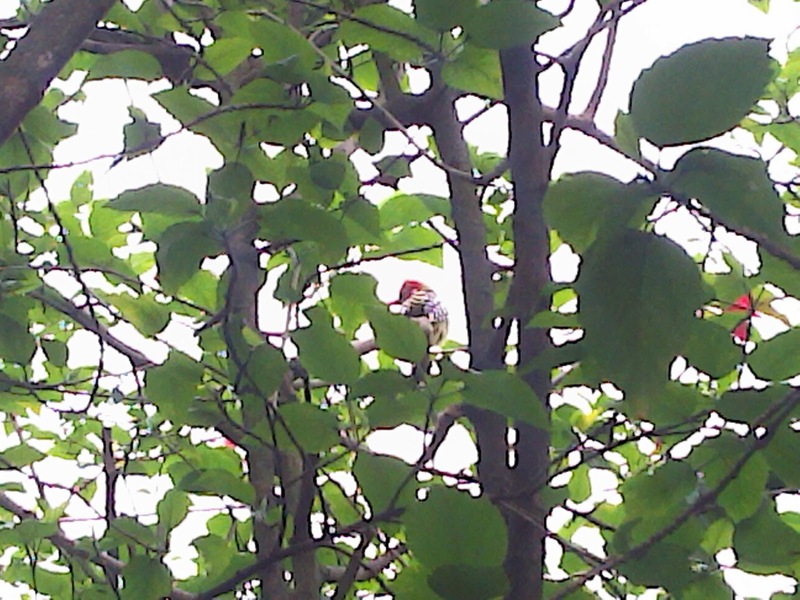 Red and Yellow Barbet. 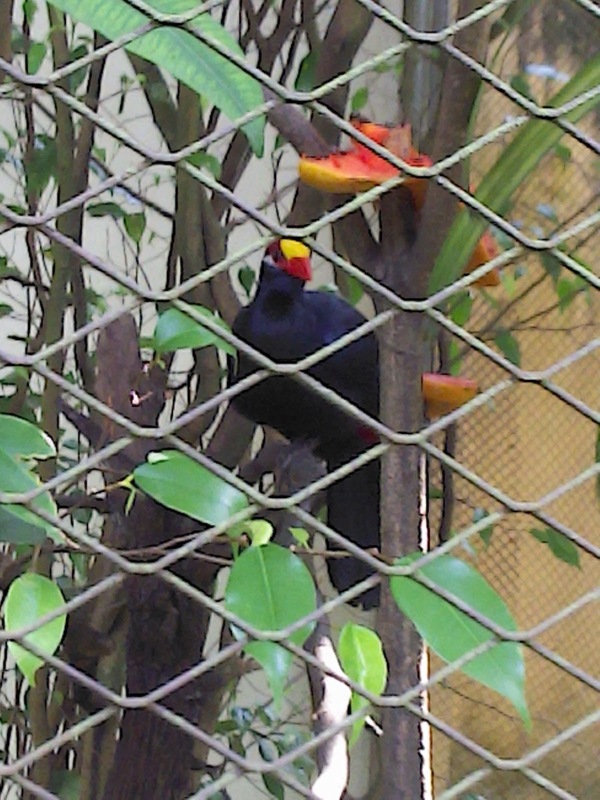 Species from African region. 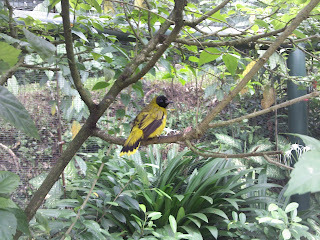 It behaved unlike any other barbet species I have seen in Malaysia. 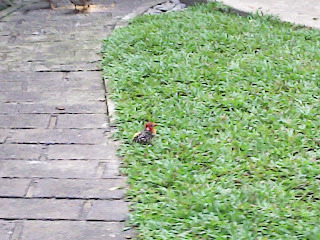 The final pic at the bottom of this blog shows it hopping around the ground and grass late evening. 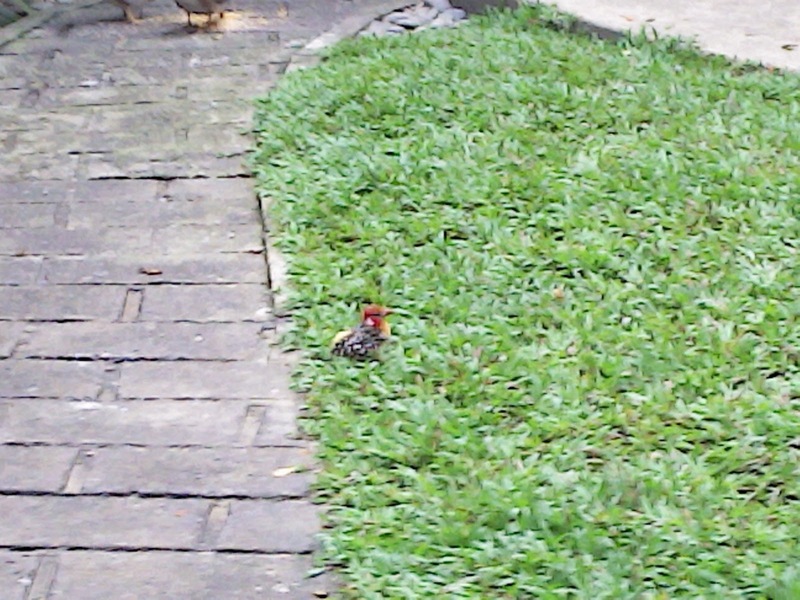 I have never seen an endemic barbet species in Malaysia, hopping around on ground before as field guides to Birds in Malaysia & Southeast Asia generally describe the barbet species as a "tree-top" bird. 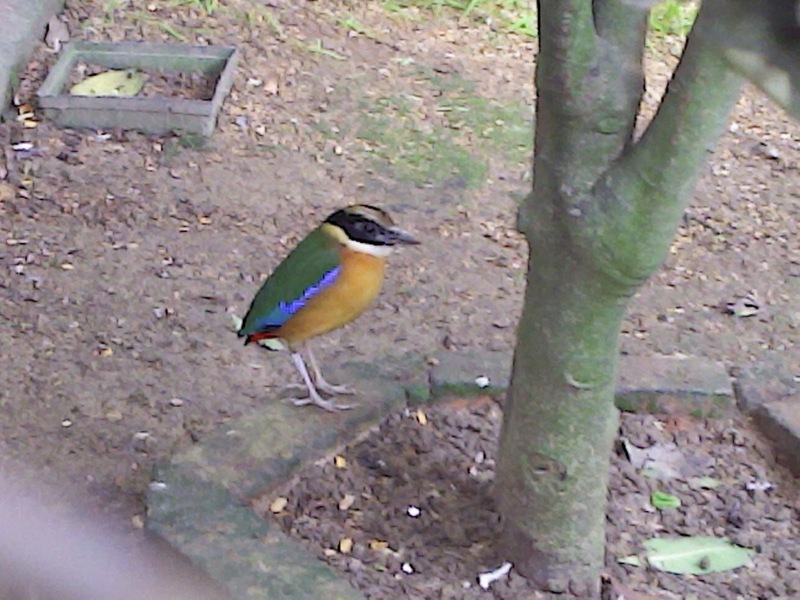 Blue-winged pitta. 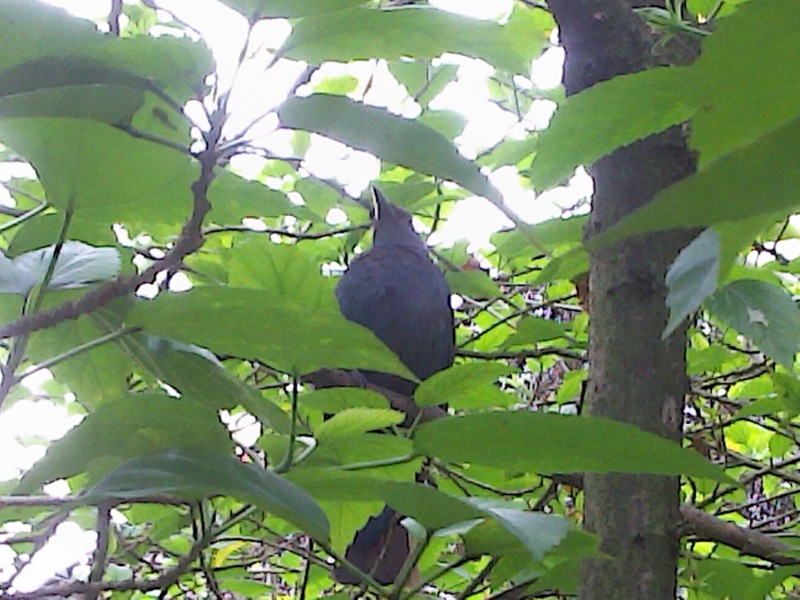 This is one bird I have always longed to see in the wild since I started birdwatching actively in 1998 but could never spot. This individual behaved very pitta-like in its shared enclosure at KL Bird Park. It shared this enclosure with the Emerald Dove and one or two other bird species but I was so engrossed in admiring this pitta that I had not jotted down what the third bird species was. 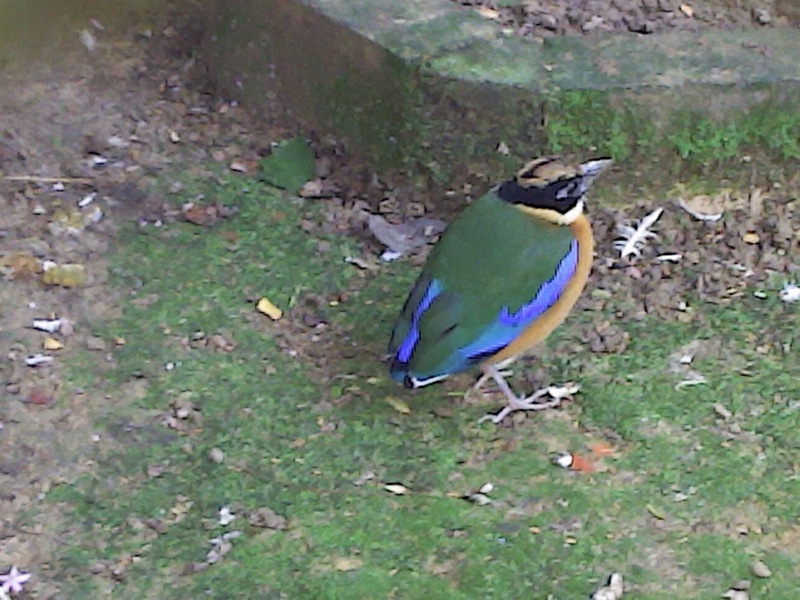 The pitta hopped onto the brick during the full 15 minutes dedicated to it and it alone. 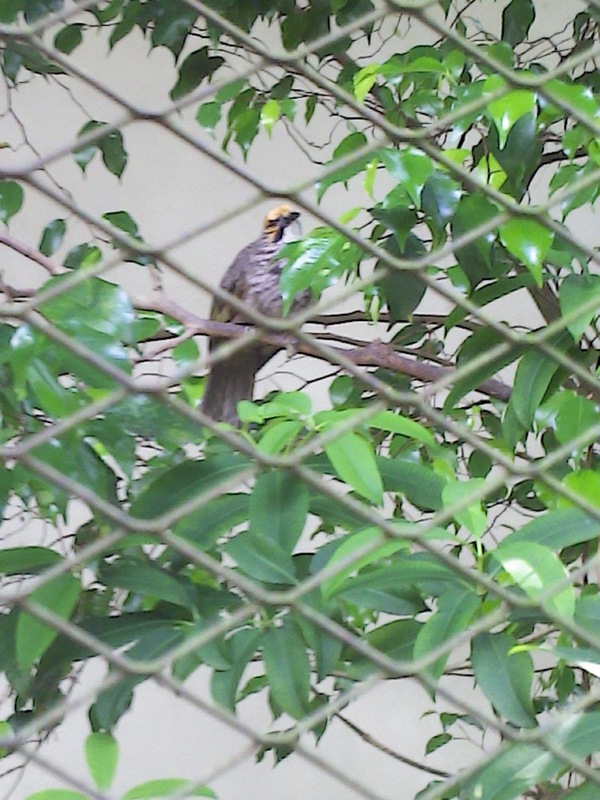 This beautiful bird maintained its mouse-like behaviour despite being kept in the enclosure. 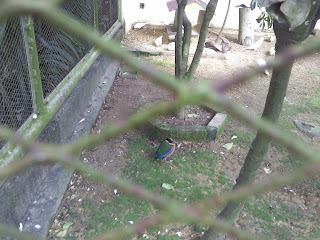 Below picture of the blue-winged pitta through the fencing of the enclosure. 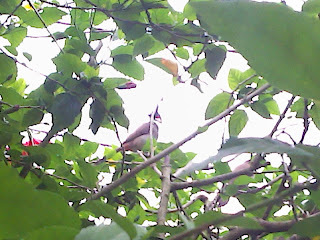 Straw-headed Bulbul at the KL Bird Park! 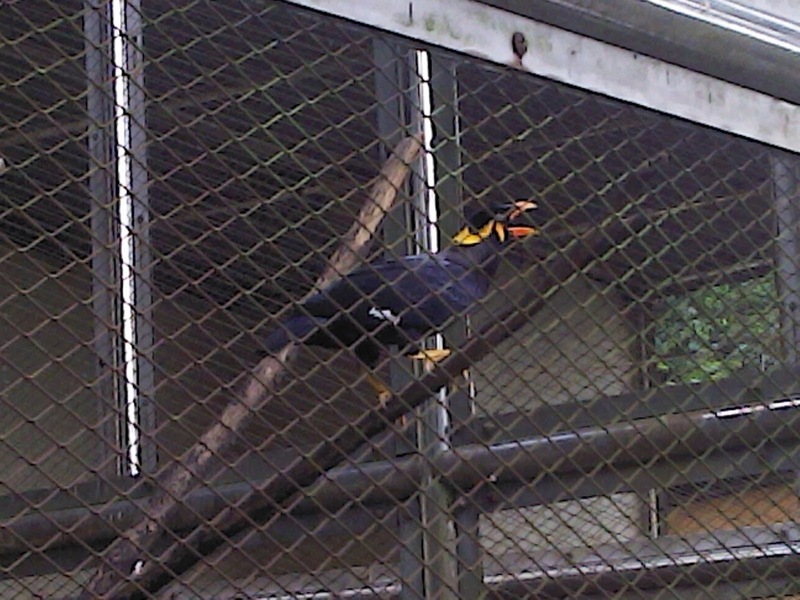 I think I spent more than 15 minutes admiring this endangered Species. 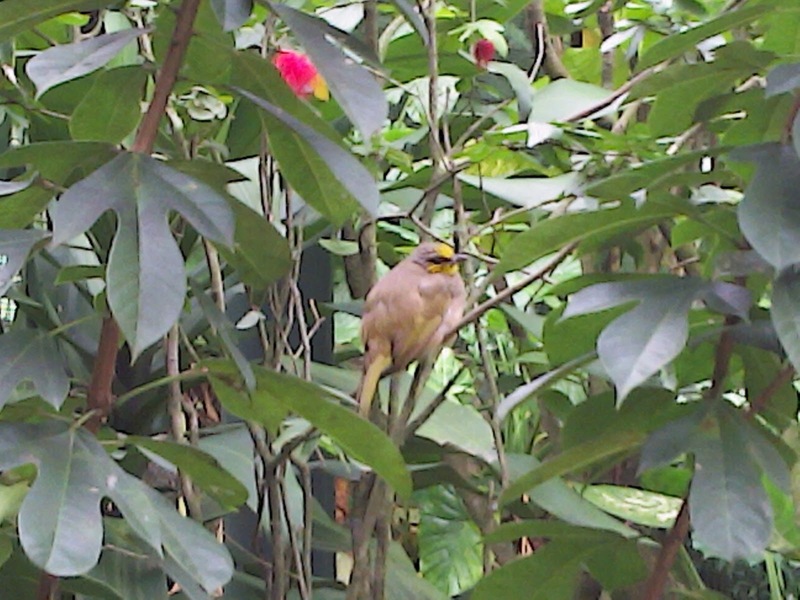 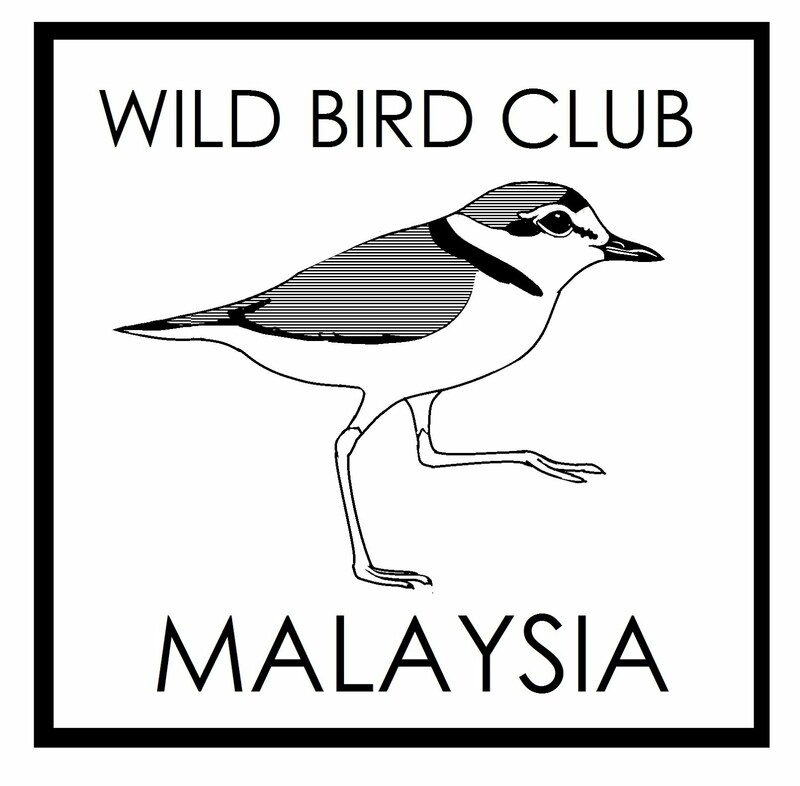 This species of bulbul was featured in Bank Negara's commemorative coin edition which highlighted the endemic bird species of Malaysia. 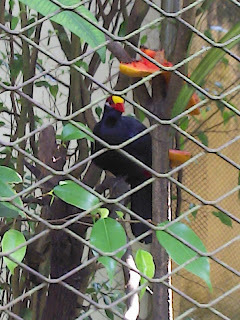 http://en.wikipedia.org/wiki/Violet_Turaco had such brilliant colours! KL Bird Park had displayed some of these birds for public to take pictures with. 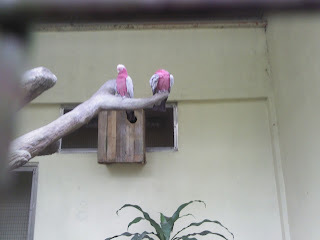 If you wanted to take a picture of these birds with your camera whilst on the wooden platform, you had to pay RM10. 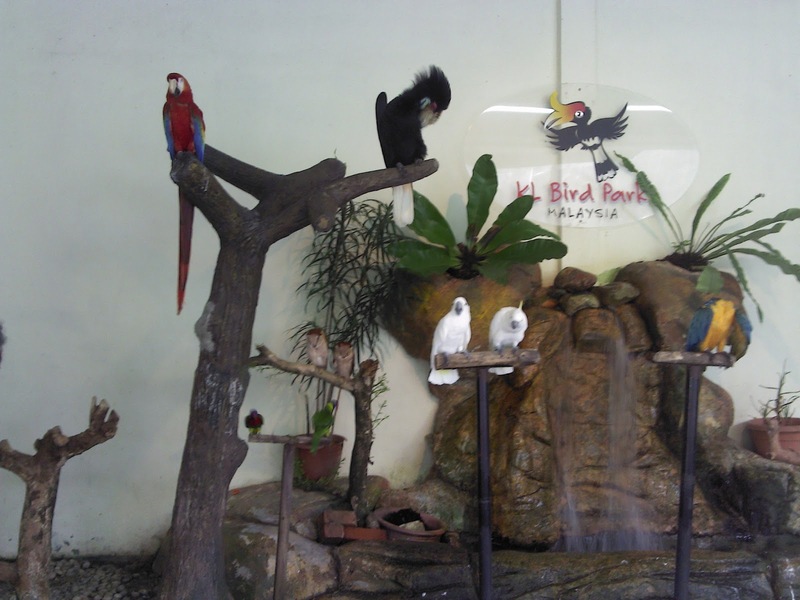 Pictures taken by KL Bird Park photographer cost higher at RM35 per picture. 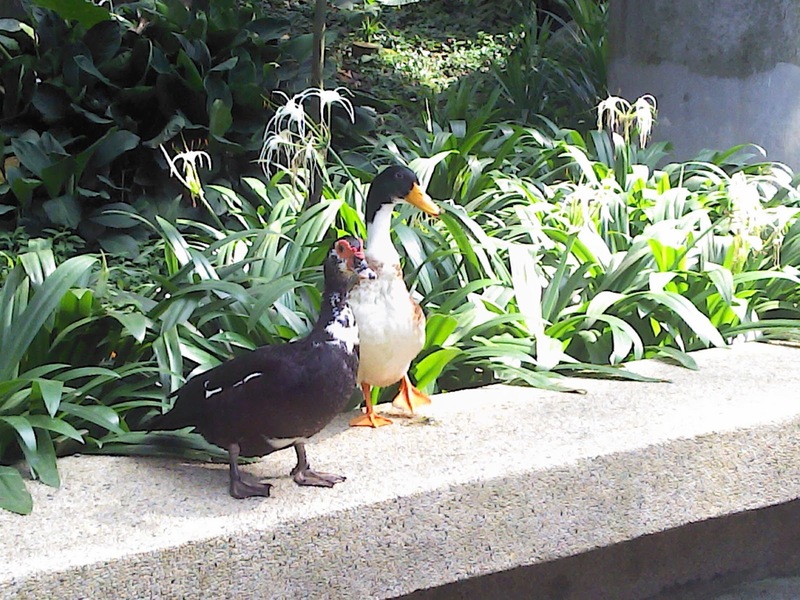 Below are a pair of mystery ducks at the Waterfall area of the KL Bird Park. 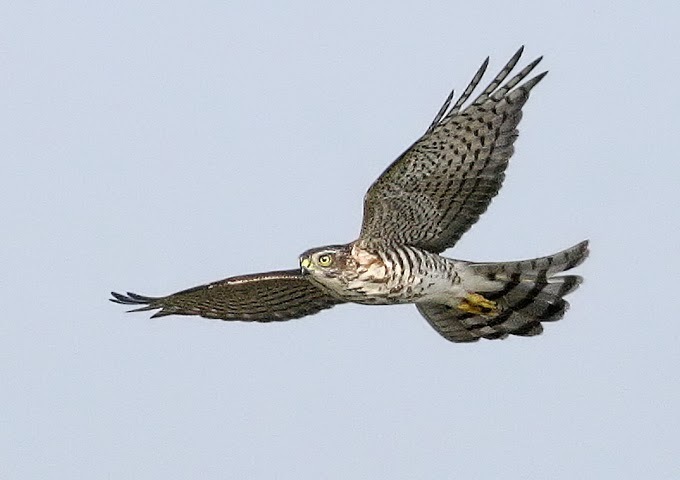 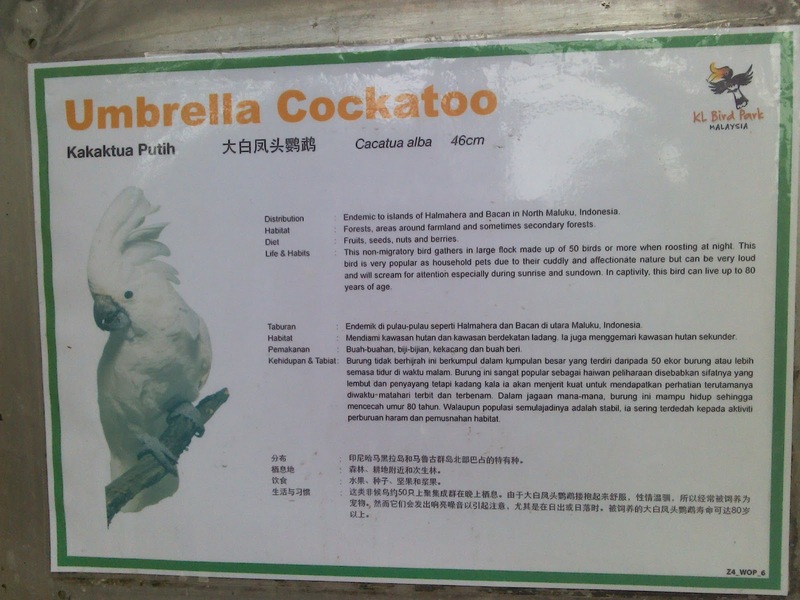 Can't identify which species they belong to in Craig Robson's Birds of Southeast Asia. 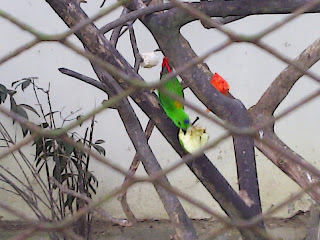 Blue-crowned Hanging Parrot. 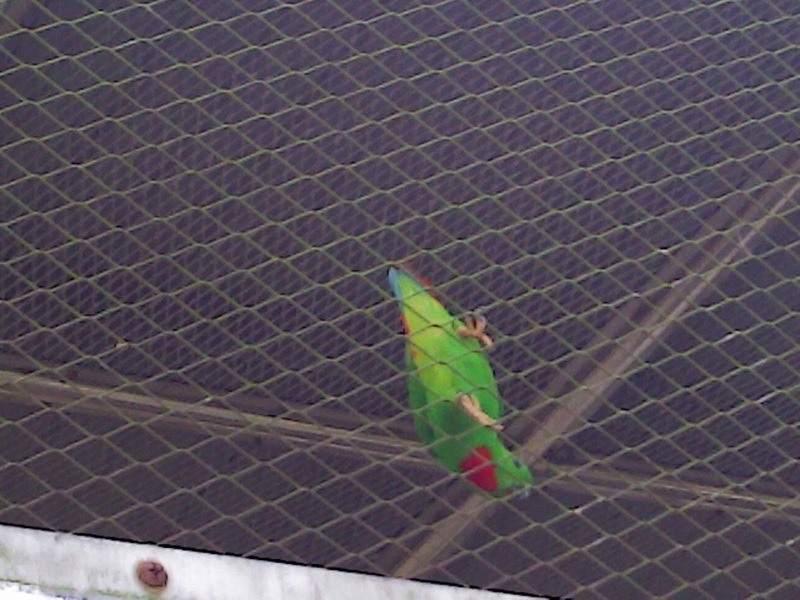 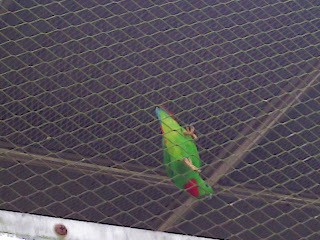 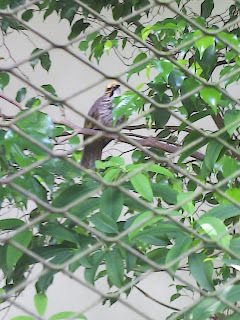 The red throat, green body and bluish tinge of the upperparts of the tail visible as it climbs upside down on the fence. The blue crown of this Hanging Parrot visible through picture below as it enjoys the apple slice below. 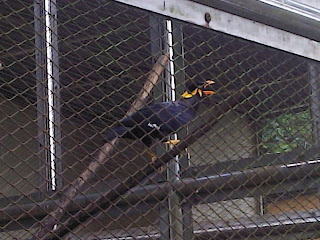 Hill Mynah. 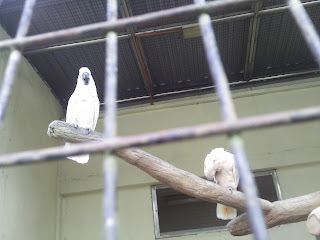 There was a pair in this enclosure. Three owl species which the KL Bird Park placed on the wooden platform for public to snap pictures at a fee of either RM10 or RM35. 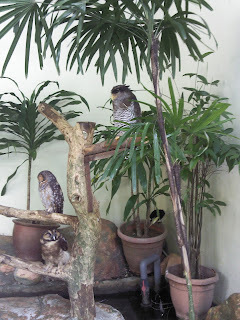 Hope the monies go back towards the maintenance and well-being of these owl species. 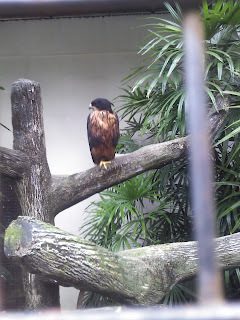 Rufous-Bellied Hawk-Eagle. 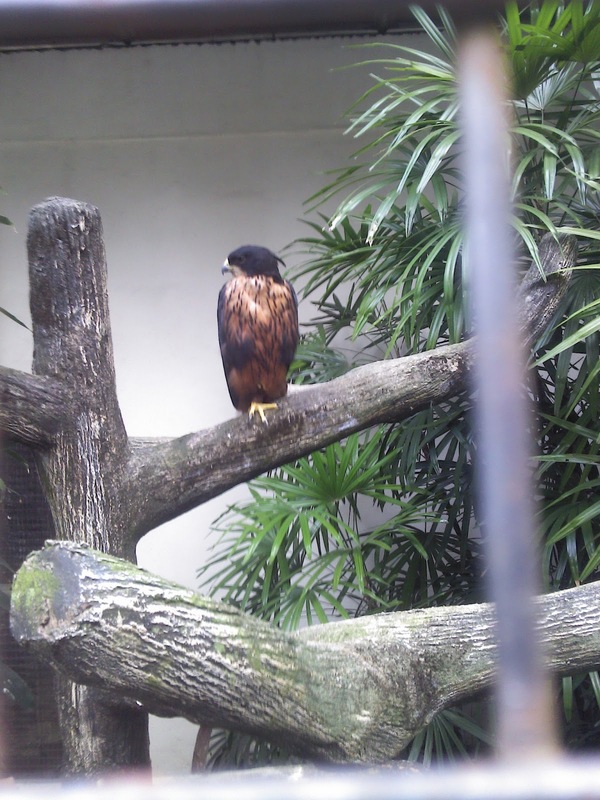 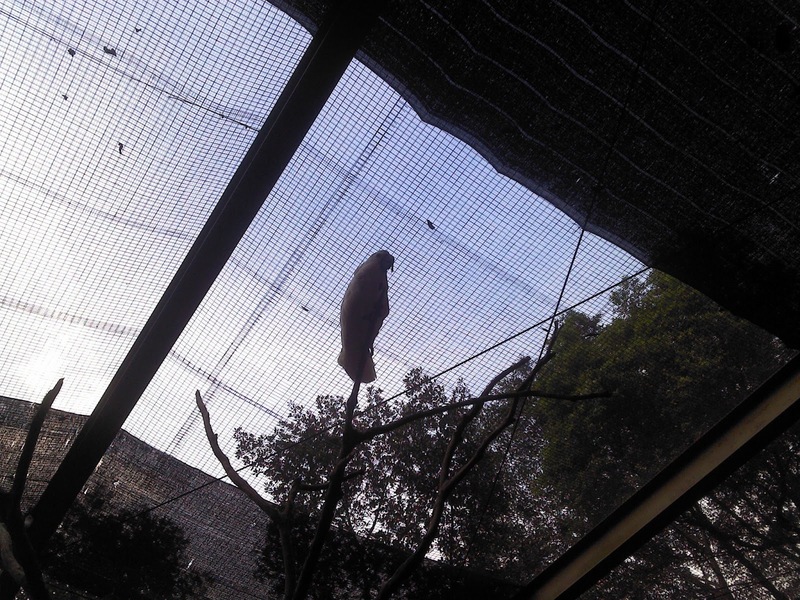 Solitary hawk-eagle in the enclosure. 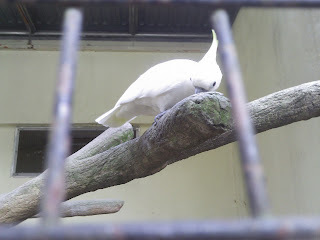 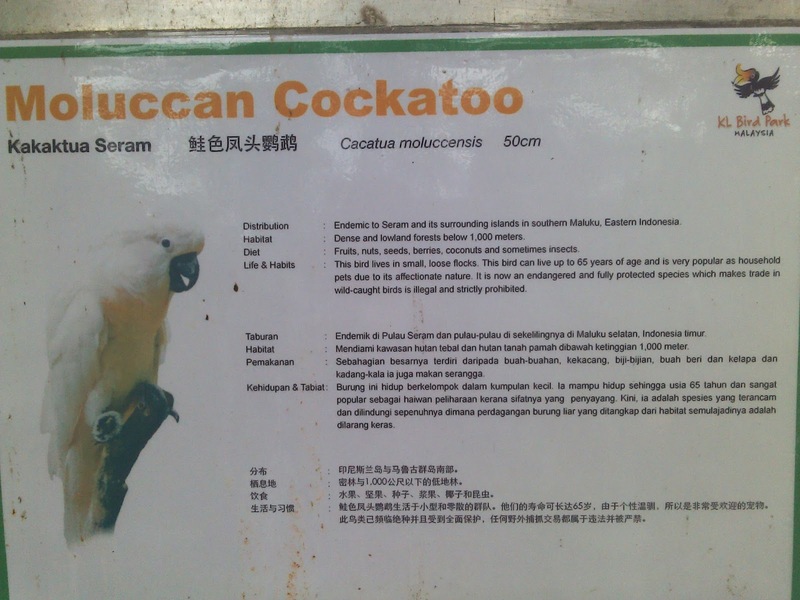 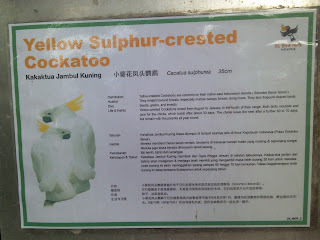 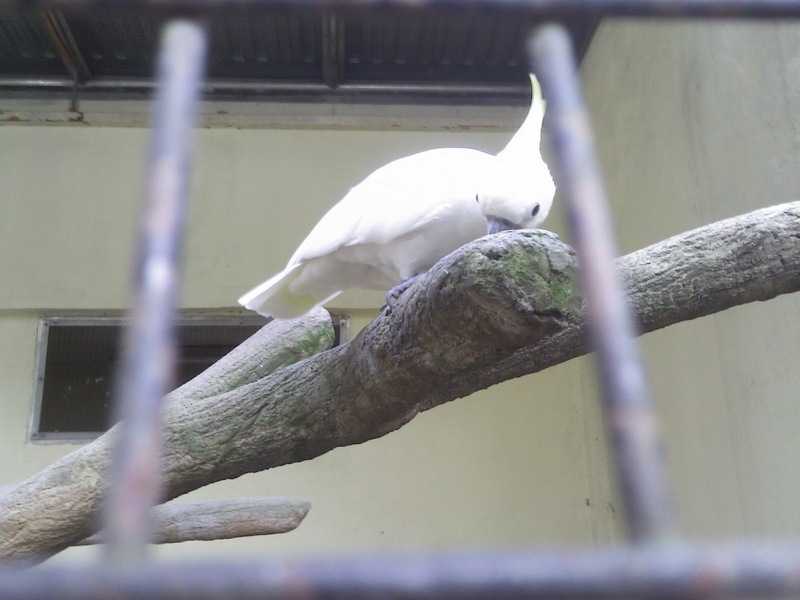 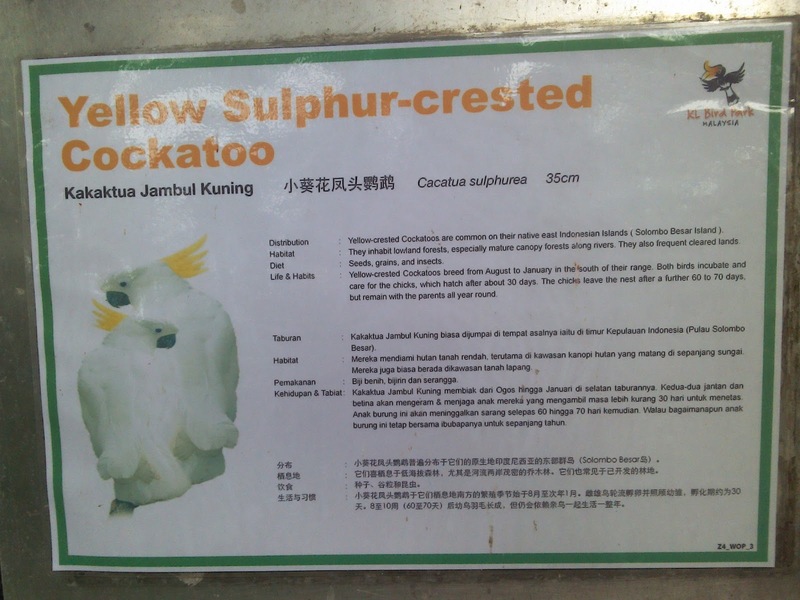 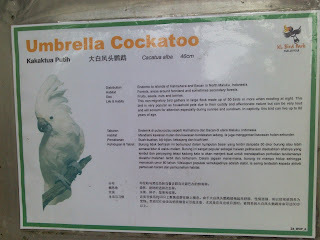 Cockatoo and Parrots of Indonesia and Australia are also kept by KL Bird Park.